Frozen strawberry greek yogurt smoothie is thick, creamy and utterly delicious! 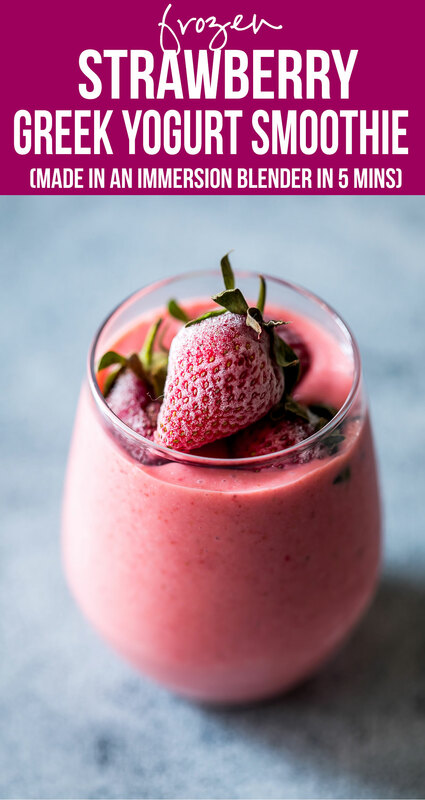 This strawberry smoothie with yogurt is the perfect protein and nutrient rich 10 minute breakfast for busy days. From the number of breakfast recipes on the blog, it might look like I’m not a breakfast person. But thats sooo far from the truth that its funny. I’m famous in the family for waking up hungry – does that happen to anyone else? Is that a real thing? And I need to eat ASAP. I’m already thinking about breakfast scenes as soon as I get up – nothing elaborate. Just a simple, delicious something to fill my stomach till I can manage something more decent. 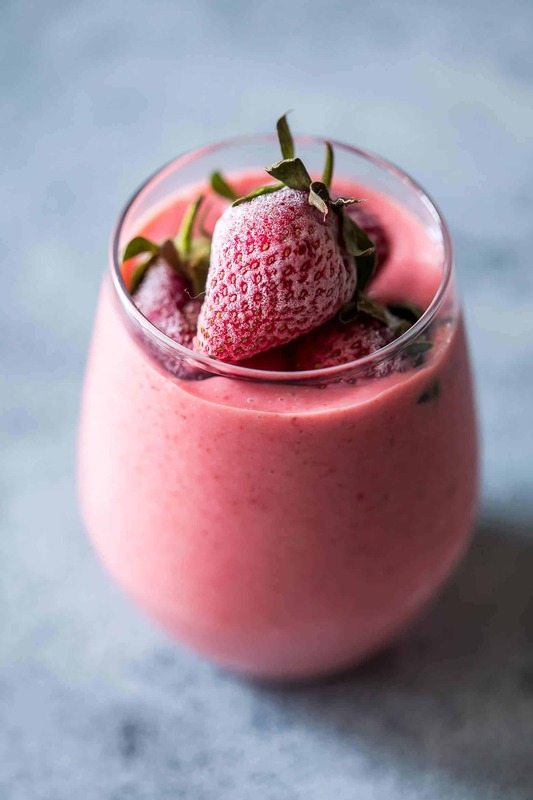 This frozen strawberry greek yogurt smoothie makes it to the list at least a few times a week during strawberry season – which it still is here in Bangalore. I’m not complaining when I see those plump berries on the shelves and have actually been hoarding them by freezing them so that they last us through summer. And let me tell you, if you want a real thick creamy smoothie you need to freeze your fruits. Its almost magical how the blender and frozen fruits work together to give you the best creamy, almost ice cream like deliciousness. 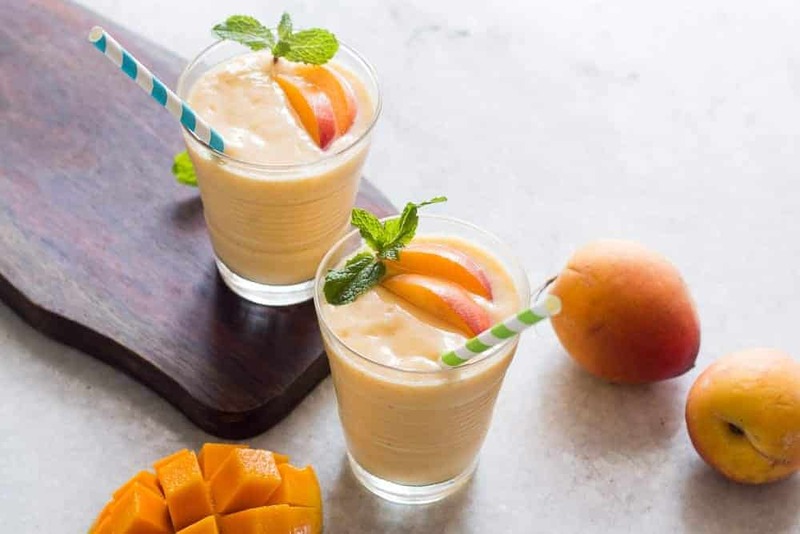 Peach season is around the corner and that’s when I’ll be switching over to my frozen peach mango smoothie. So we have options guys. 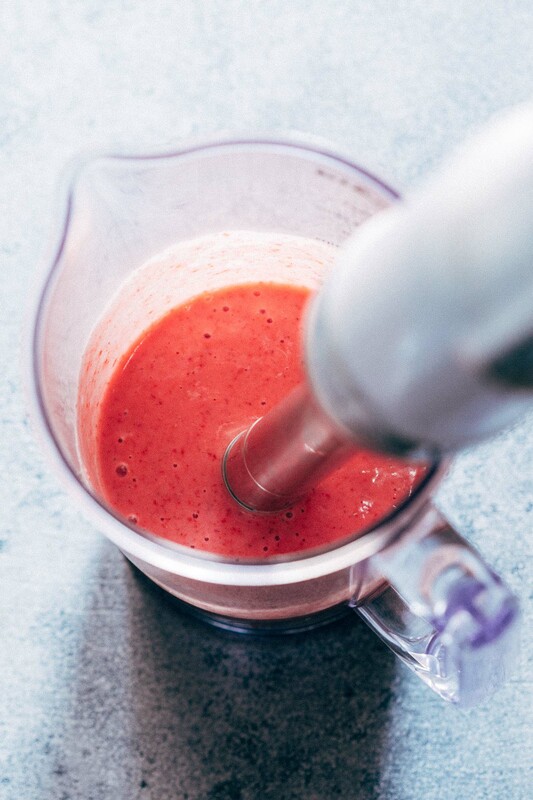 This frozen strawberry greek yogurt smoothie is only three ingredients and all the job is done by my favourite immersion blender. I swear its topping the list of favourite kitchen gadgets to use these days! Because it is pretty awesome, and once you start using one, you will probably get rid of a lot of other things that are taking up precious space on your kitchen counter. Lets talk about immersion blenders for a second. Because I’ve been experimenting with mine and pushing the limits. So far we’ve successfully made pesto, smoothie, pureed soup, whipped cream, whipped eggs for the fluffiest omelette in the world, churned butter, made salsa and homemade mayonnaise. How is that for an awesome list of things you need that immersion blender for? I have a KitchenAid blender which comes with multiple attachments, all set up in a neat little box. But honestly, I hardly ever use all of them. One of the blades and the whipping attachment is what sits on my counter along with this cordless (yesssss cord freee!!) stick blender. I was afraid that my blender won’t be able to blend these rock solid frozen strawberries, but with a little greek yogurt and this powerful machine showed me that it means business. This is really going to be smoothie 101. Because we all need this list. What goes into a smoothie? You can get as creative as you want with a smoothie. 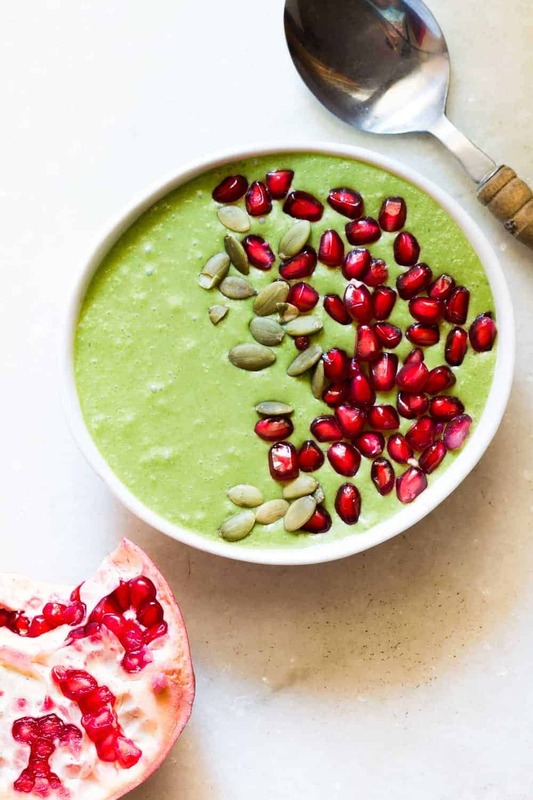 Fruit, green leafy vegetables, water, any other liquid (almond milk, coconut milk, greek yogurt, milk) and a sweetener are what you normally need for a smoothie. These are elements which you can use to make your own favourite combination. In addition to this, you can add oats; super foods like chia seeds, matcha, spirulina; and tons of other things. Here’s a great resource to give you green smoothie 101 if thats what you prefer. 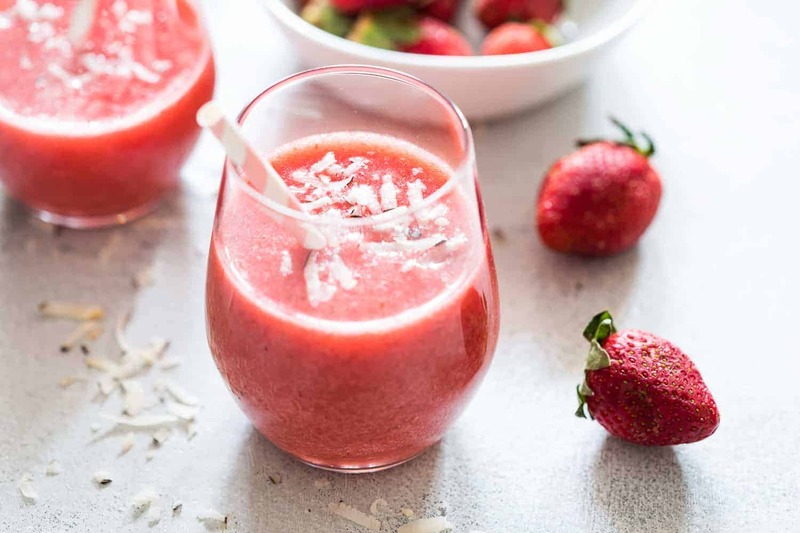 Why freeze strawberries for this frozen strawberry greek yogurt smoothie? 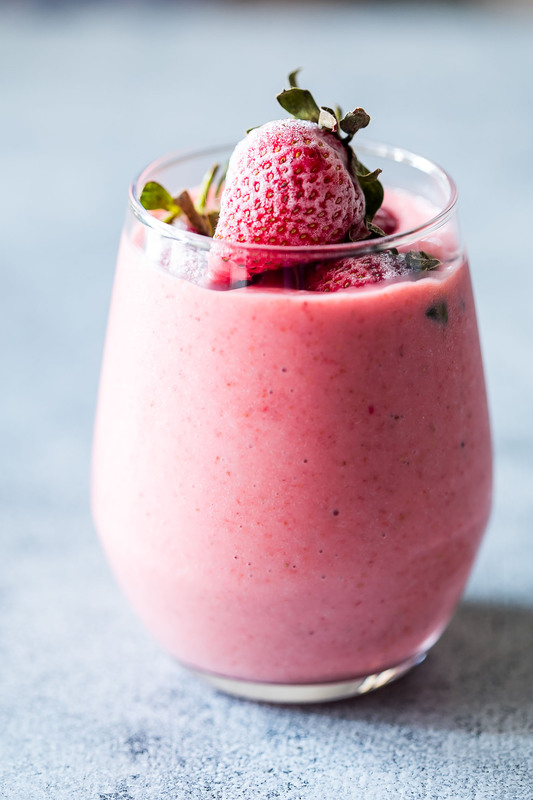 Strawberry smoothies like this frozen strawberry greek yogurt are great for you to start the day. 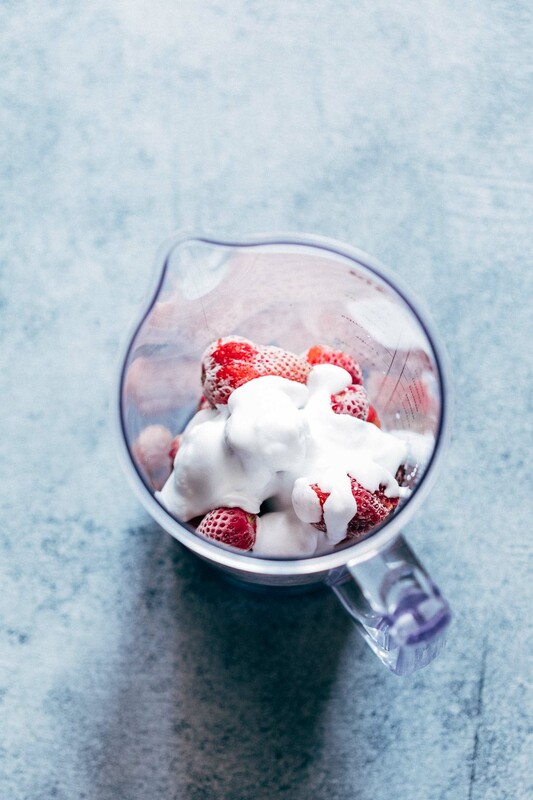 Greek yogurt is packed with protein, whereas strawberries are rich in antioxidants and Vitamin C – which means all good things. Before you go away, I do want to add that I still love eating fresh fruit and nothing can replace the fiber in fresh fruit. But when I want breakfast in 10 minutes, this frozen strawberry greek yogurt smoothie really does the job!